“Nick Drake,” he replied shrugging, with a smug look and a tone that said, “No duh, what are you an idiot? You don’t know Nick Drake?” I returned to my table transfixed. Even though I’d been planning to leave, I stayed. Listened to the entire album, then immediately went down the street to Plan 9 and bought his entire catalog even though I couldn’t afford it. The fact it was only 3 albums was bittersweet. Most of all, I loved Betsy’s biscuits. 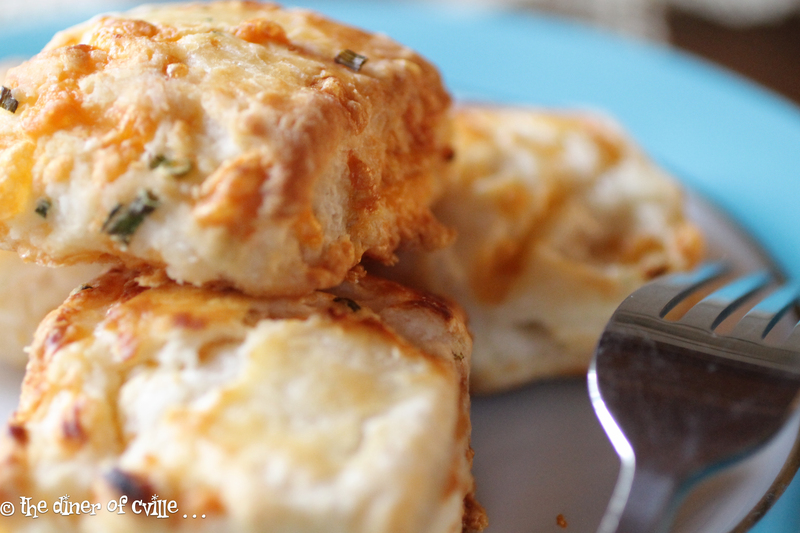 Cheddar and chive. Feta and rosemary. Sage and gruyere. 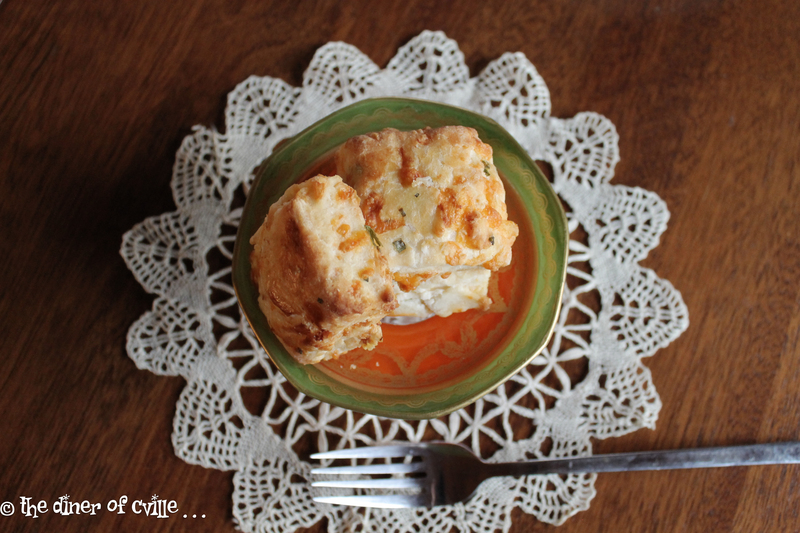 Always some gorgeous mixture of cheese and herb mixed magically into a light-as-air biscuit the size of your hand. They’d slice through this slab of deliciousness, dab on pats of butter, then run it through the toaster oven. It arrived at your table piping hot and perfect. A buttery present. It made studying all those dry-as-dust topics so much easier. Ever since I’ve wanted to recreate these pillows of magic. But always too scared to try. Every time I attempted it, I’d imagine Edna Lewis over my shoulder scolding and wagging her finger. So I’d just give up. Now bread is another story. I can make bread. Started with a breadmaker, eventually graduating to real boule bread after much trial and error. Bread is easy peasey compared to making biscuits. Somehow in my mind biscuits are the penultimate bread baking skill. Like pie crust. Like soufflé. Anyone can make biscuits that taste like dust or feel like hockey pucks in your stomach, something that could take out an enemy with one throw, but real light-as-air biscuits? That my friends is an art. And to make them like they were at Betsy’s? Well I could just shut my mouth, die, and go to heaven happy. Finally worked up the nerve, and guess what? I did it. Not sure what happened, maybe in my mind I talked them up so much I palavered them up to the realm of impossibility, but I did it. I made Betsy’s biscuits. Perfect the first time out. Used a recipe from Cook’s Illustrated and tweaked it and what came out of the oven was JUST as I remembered. Which makes me very happy because now I can “go to Betsy’s” anytime I want. The coffee shop may be gone (it’s a wine bar) but her biscuits live on. Well, not for long. Most of them end up in my stomach within the first hour or so. . .
Preheat your oven to 450 degrees with the oven rack in the center. Mix flour, baking powder, and salt in a large bowl with a fork. Add butter. With pastry blender or two forks, cut the butter into the dry ingredients until the butter is the size of peas, and the mixture resembles a dry oatmeal. Make a well, and stir in the milk, buttermilk, cheddar cheese, and chives with a rubber spatula until just moistened. Form the dough into a ball, making sure not to overhandle it. Wrap the dough ball in plastic wrap and refrigerate. This dough may be refrigerated for quite a while. I make biscuit dough on Saturday nights and cut them to cook on Sundays. At the very least, let the dough rest in the fridge for 10 minutes before rolling it out. Roll the dough into a rectangle (roughly 6″ by 10″) using as light a touch on the rolling pin as possible. With the long edge of the dough facing you, fold in both short ends so they meet in the center; then fold the dough in half by width, forming a package of dough four layers thick. Once again, roll the dough into a 6-by-10-inch rectangle approximately 1/2-inch thick. Using a big knife, lightly floured, cut this rectangle in half, then make 3 cross-wise cuts, resulting in 8 biscuits. Place each biscuit on an ungreased baking sheet and brush lightly with buttermilk. Cook until browned, about 10-14 minutes. Good straight out of the oven, cold with coffee, or reheated the next day. ← Welcome to the Diner!